Otherwise known as Ruby. Has been tested PRA clear. Ruby is Poppy's niece and Ebony's first cousin. We purchased her as company for Poppy since at the time she was on her own and starting to become paranoid about being left alone. The two ended up as best mates, and Ruby is now 2nd in the pecking order in the pack. Ruby is an active affectionate dog who is great with children. A bit of a handful at times since she is full on, likely to give a full on face wash instead of a kiss. She loves running on the beach and sitting on Peter's lap. Favourite activity is eating dinner, second favourite activity is eating seconds. So, no eating problems with Ruby. Overeating problems maybe. Ruby believes in everything to excess. So with Ruby it is walkies as fast as possible and as often as possible. Once a day is good, twice a day is better and 3 times a day is wonderful. We compromised on once a day! Mention the word "walkies" or "Kalaru" and she will bolt out the door. In summary, a bit of a lovable tomboy. 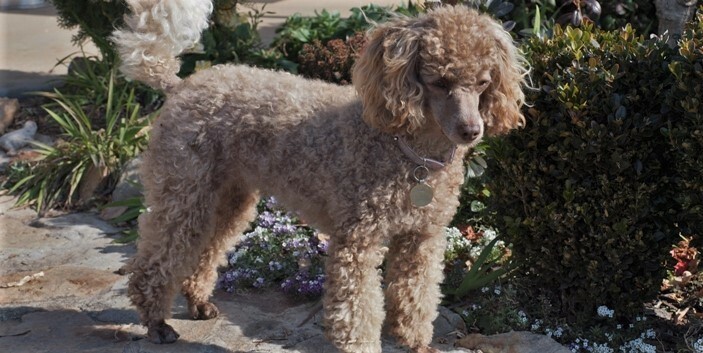 Ruby was dark brown as a puppy, but as with most brown poodles her colour has faded as she got older. Ruby has had 4 litters of beautiful puppies and is now retired from breeding.